Six suspected militants from a group linked to al-Qaeda have been sentenced to death by a court in Kuwait. The six were handed the sentence for their role in clashes with police in January which left several people dead. The court jailed some of the other alleged members of the group of more than 30, while seven were acquitted. 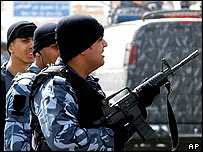 Dozens of suspected Islamists opposed to the US presence in Kuwait have been held in 2005 and accused of planning attacks on western targets. Prosecutors had demanded the death penalty for more suspected militants of the group - which calls itself the Peninsula Lions Brigade - for several shootouts with police in January. They had also said the group plotted to stage suicide attacks in Kuwait and planned a coup. Defence lawyers have said their clients were forced to make confessions after being tortured. Some 20 alleged members of the group - mostly Kuwaiti nationals - received jail terms of between four months and 15 years, while one was sentenced to life in prison. Among those on trial were several foreign nationals. The verdict was read out in the absence of all the accused, with lawyers and reporters being the only people present in the court, according to the AFP news agency. Kuwait is a major oil producer and US ally in the Gulf. A military base in the territory serves as a logistics centre for US troops operating in neighbouring Iraq.